Motorbikes could soon be sporting collision detection and other safety features more usually found on cars. Research is testing ways to put these systems on motor bikes and how best to alert riders to dangers on the road. The systems tested include warnings about speed limits, the tightness of road bends and information about other vehicles to aid lane-changing. 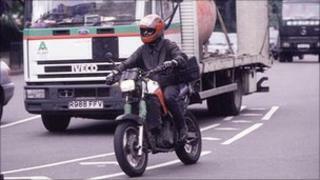 The first bike-based safety systems could be appearing on motorbikes within two years, say researchers. Proof of concept tests on the Saferider systems, as they are known, have been carried out in simulators and on road bikes by Mira (formerly known as the Motor Industry Research Association), which acts as a testing and innovation centre for carmakers. "Saferider takes the driver safety systems that are becoming standard on cars and tries to adapt them to the unique needs of motorcyclists," said Jonathan Moore, an ITS consultant at Mira, involved in the Saferider project. Statistics gathered by Mira suggest that about 22% of all road accident fatalities involve bike riders and it is the only mode of transport which is seeing a rise in the number of deaths. Mr Moore said making safety systems on motorbikes useful was "challenging" because of all the distractions to which riders were subjected. "One of the most difficult things is getting the rider's attention," he said. "There's a high level of ambient noise and vibration to deal with and we really don't want motorcycle riders looking down at the handlebars any more than they need to." Media captionThe Saferider system allows motorcyclists to send SOS alerts and warns of potential hazards. Video provided by engineering consultancy Mira on behalf of Saferider. Mira has been investigating how to use haptic, tactile feedback systems to safely get the attention of riders and warn them about other vehicles, prepare them for the road ahead or give help at junctions. Mira engineers outfitted a Yamaha Tenere and a Triumph Sprint with the safety systems so they could be tried out on a test track. The systems include laser scanners, haptic handles and gloves, a vibrating seat, lights, smart helmet-cameras and radar as well as a pannier full of the electronics that analyse data gathered by the sensors and pump out warnings. One system tested works out if riders are travelling too fast to negotiate upcoming bends. Mira has developed software that acts as a "co-pilot" which, with the help of a digital map, knows what speed they should be travelling to make it round a bend. "One system under test based around radar constantly monitors the blind spots around and behind riders," said Mr Moore. "Vehicles behind or to one side of a bike can be hard to spot because the helmet restricts visibility and riders must remember to move their head regularly to check." "We put a motor in the cheek pad of the helmet so if you do not notice the object it will vibrate and give you a tactile warning that there's something to the right or left," said Mr Moore. The system can also help give a rider information about traffic further behind in adjoining lanes to help with overtaking or lane-changing. Motorbike collision detection systems developed by Mira warn a rider about an imminent impact and let them take action by slowing down sharply or, in the case of a vehicle travelling in the same direction as the bike, following it while slowing. The safety systems could be a boon to less experienced bike riders. "They do not give the attention to the road they should or have the experience to deal with problems," said Mr Moore. The prototypes demonstrated by Mira showed it was feasible to fit such safety systems on motorbikes, said Mr Moore. He speculated that manufacturers would start to put them on bikes within the next 18 months to two years. Saferider is a collaborative R&D effort that is part of the European Commission's Seventh Framework Programme. Participants include Mira, Yamaha, Porsche Engineering and Fema, among others.